What's a brunch without good bread? For this one, a fine olive oil makes all the difference. Growing up, convenience foods were an alien concept for my family. My mother loves to cook; and fresh, home cooked food was something we took for granted. For instance, breakfast would be fresh coriander-flecked poha, steaming hot upma, or aloo paratha topped with homemade butter. Little surprise then that bread was not a usual occurrence in our house, especially as a breakfast item. At the most, it made an appearance as a crouton in tomato soup. I can still remember the first time I ate toast. I must have been something like five or six years old, and on a play date at a friend’s house (We didn’t call it a play date then, it was just playing). As an evening snack, my friend’s mother gave us slices of hot toast, generously buttered with Amul butter. I took a crunchy bite, relishing the crumbly texture, the oozy butter, and I couldn’t help but wonder why had this wondrous thing been missing from my life all this while. I went home and badgered my mum to make us toast. I am pretty sure she rolled her eyes – here she was making us fresh food, and there I was, demanding processed white bread. We moved from Delhi to Mumbai in the early Nineties, and I was amazed to see the range of bread being delivered to your doorstep. Our feisty neighbour, Mrs. Batliwala, would give the bread wallah’s basket a once over for fresh paav, local bread, and buns, apart from kharis and nankhatais. It was at her house that I first came across Wibs with its iconic blue, white, and red waxed paper packaging. And then later, the fabulous street side sandwiches of the city. Years later, we found out that this white-maida bread was as evil as Voldermort’s horcruxes. So we turned to whole wheat versions and discovered the joys of artisanal bread. Then we found out that processed brown bread often is just maida with caramelized sugar giving it the brown colour. And now all that news about processed bread possibly containing carcinogens. Bit of a problem, given that bread makes for a cheap, convenient food. On week days, breakfast is a choice between homemade granola and dahi, or toast and chai. On days I don’t feel like cooking, it’s easy to fix a quick sandwich. More and more, I find myself baking whole wheat bread at home. My friend Deborah gave me a quick bread making class – she makes the lightest ragi bread I have ever eaten. My friend’s father, Sujit Sumitran, showed me how to make a wonderful sourdough bread. Bread, I am discovering, isn’t that difficult. Of course, I don’t always make heathy breads. On days that I am feeling more indulgent or have friends coming over, I make this focaccia. One tip: use good olive oil for it – I used Cannan, an organic, cold-pressed, extra virgin olive oil from Palestine. Amazon stocks it, and as the label says, it helps “farmers stay on their land. It is produced by farmer cooperatives”. If you’re spending good money on an olive oil, try and find one where the money goes back to the farmers. Method * Put the tepid water in a glass and mix yeast and sugar into it with a fork. Leave aside for a few minutes. You know the yeast is active when it starts to foam, and if you “listen” to the mixture, there’s a distinct hum. * Mix the atta and maida with ½ tbsp. of sea salt and make a well in the middle. Pour in the yeast mixture and stir with a fork. * Put the dough on a clean, flour-dusted surface and knead for five to seven minutes. To knead, push the dough away from you, and bring it back towards you. * Put in a greased bowl, pour some olive oil and cover with a clean kitchen towel. Leave to prove for half an hour. * To prepare the topping, slice the onions. Sauté them with rosemary in olive oil until the onions are translucent. Add balsamic vinegar and fry for another couple of minutes. Keep aside. You can make your own topics – cheese, basil, and tomato; cheese and rosemary; sundried tomatoes and olives – it’s up to you. * Preheat the oven to 220C/ 425F. Line your baking try with some semolina. * When the dough has doubled in size, pound it and place it on the tray, so that it covers the bottom. * Pour some olive oil on the bread, and push it down with your fingers so that it becomes like small hills and valleys. * Press the onion toppings on the focaccia. Top with sea salt, pepper and a good drizzle of olive oil. Leave to rise, covered with a wet kitchen towel, for around 30 minutes. * Bake for 20 minutes. 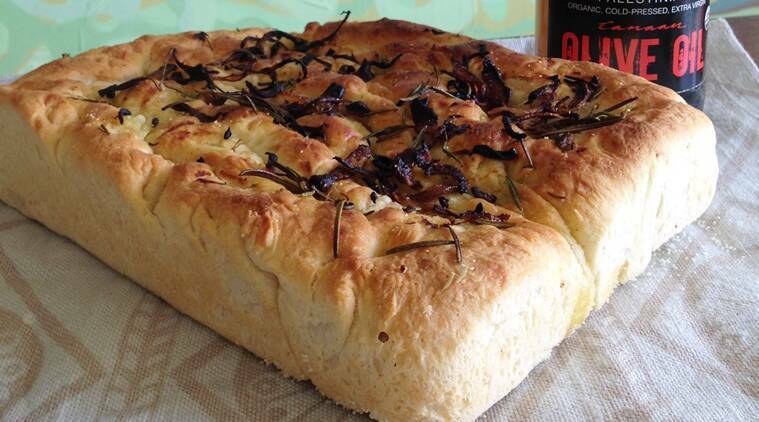 When it comes out of the oven, top the bread with some more olive oil to keep it moist.